Port Jackson bay beach and Departmenf of Conservation (DOC) campsite with summer campers and tents on foreshore. Kaiiti Point behind. 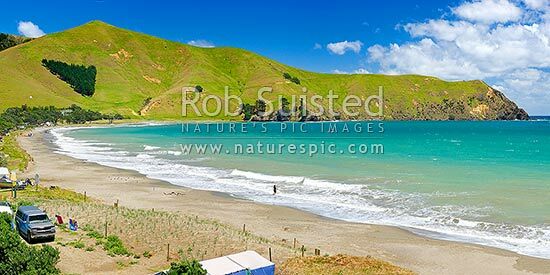 Panorama, Cape Colville, Thames-Coromandel District, Waikato Region, New Zealand (NZ), stock photo.